We all want our parents to remain as active and independent as possible, and we want the same thing for ourselves! 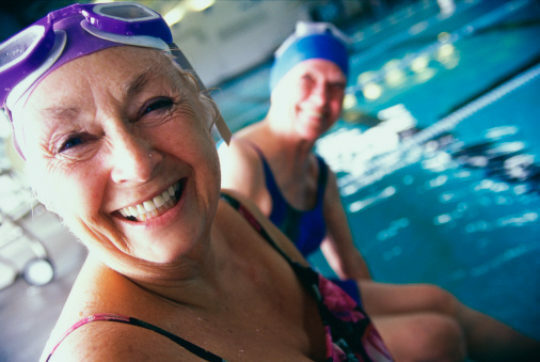 Regular exercise is pivotal for seniors. Seniors are at greater risk for disease, lost mobility and falls than any other age group. Conversely, they often realize the positive effects of exercise more quickly than other age groups. Look for daily opportunities to exercise. Park away from the store and walk briskly to the entrance. I had my mother rent the apartment furthest from the facility restaurant. She ALWAYS made it to dinner. Try several different exercises to find what you like best. You will be more likely to stick with the ones you enjoy doing. Find a buddy. You are less likely to skip a workout if it means saying “no” to a friend. Join a walking group, visit your local Y, rec center, park, church or senior center. Malls often open early to allow walkers to get in a workout before the shopping starts. Working those ever important hamstring muscles helps to decrease the risk of falling. Balance is so important. Stair climbing, getting out of a chair, and other acts of mobility increase your balance. Breathe deeply. Just filling the lungs with air can stave off pneumonia. Combine those deep breaths with fully stretched arms being raised straight out and then overhead and you can increase your range of motion at the same time. Add some music and work it to the beat! Keep it fun! Batting around a balloon can be aerobic, and can increase your range of motion whether you do it from a chair or on your feet! There is no need for seniors who use wheelchairs to miss out on the fun, or health benefits. Jodi Stolove’s chair dancing offers a variety of stretching, muscle building, and cardio exercises that can be done from the comfort of a chair. -Barbara McVicker, eldercare expert, national speaker, and author of Stuck in the Middle: Shared Stories and Tips on Caring for Mom and Dad.